LEN - www.lankaenews.com | Railway strike and foolish Sirisena’s betrayal to entire country’s detriment ! 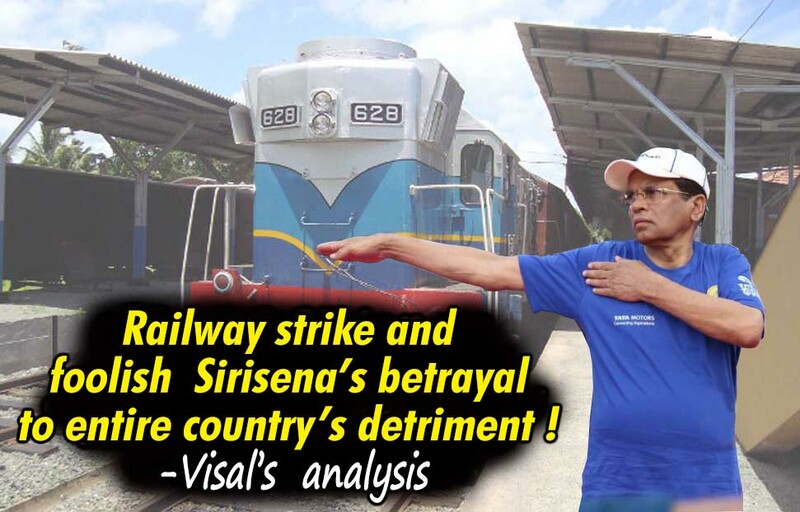 Railway strike and foolish Sirisena’s betrayal to entire country’s detriment ! This unjustifiable strike can be identified as one against which the biggest opposition was mounted by the enraged people in country’s history and the strikers were at the receiving end of an assault in public and had to face an opposition which was most humiliating to them. The resentment against the railway drivers was so bitter and fierce , according to reports they were forced into a situation where they were even frightened to stay in their homes. It was the view of not only the railway commuters but even the general public that stern action should be taken against these saboteurs . Besides it was the majority opinion that the government should not capitulate to these trade union terrorists and they should not be permitted to emerge victorious in their dastardly and disruptive activities. They also insisted that a solution should be found for this strike by other methods rather than by negotiation with the callous striking trade unionists who are saboteurs and plunderers. An alternative proposal too was made in consonance with the opinion of the majority, and the bus service of the forces as well as the CTB services were deployed. These services deployed were in operation without bus fares. The service was run for and on behalf of the GCE advanced level exam students , and therefore there was not a single incident reported that students could not attend the exams. Moreover , the assistant train drivers came before the media and said , they are able to run the trains. In addition , when the deputy minister Ranjan Ramanayake was met by them they said , if they are provided with the opportunity to run the trains they would never engage in strikes which would inconvenience the public , and they are prepared to vouch for that by writing in blood. Meanwhile proposals were made that a group of the railways be sent to India for train driver training assisted by Indian train drivers. There was also a strong proposal from the public that the railways department shall be privatized. It is significant to note that in SL’s history of strikes , never was such a proposal made by the public against strikers . The conspiratorial background to this strike was the publicity given to an un-proposed salary increase . It were the political conspirators behind the strike who gave this publicity , and Dinesh Gunawardena the mischief maker at the party leaders meeting said , when the salaries of judges are raised , during the Mahinda Rajapakse era the salaries of the parliamentarians were also increased commensurate with that .The party leaders interpreted that statement as a joke , and did not consider it . Though he did not make any concrete proposal in that regard ,a specific newspaper started concocting stories and reported MPs salaries are going to be increased by this percentage and that .Even after the speaker confirmed there is no such move , it was reported to give a mischievous twist that if the salaries of MPs are increased , there will be an annual expenditure of so much, solely to mislead the people. These were all newspaper canards. Sirisena alias Sillysena too made a statement in Polonnaruwa fuelling the fire .When this became widely known among the people , in pursuance of the conspiracy enlisting the henchmen, a sudden railways strike was staged demanding a salary hike. It was the calculation of the conspirators , if the MPs are going to raise their salaries so much and the railway demands a salary rise vis a vis the MPs salary hikes , the public will view that as reasonable and be patient . Unfortunately for the conspirators , the people were not that foolish . They proved that beyond doubt by mounting the most gigantic protest in SL ‘s history against the strikers in the Fort. Mangala’s unerring and meaningful stance…..
Finance minister Mangala Samaraweera of course took a firm stand that salaries cannot be raised in the way the railways trade unions demand. If the salary increases are granted , the entire salary structure of the state employees will face anomalies , leading to a series of strikes , the minister pointed out. In the end , he was pushed to the point to say the cabinet has no backbone. Mangala’s stance was right both from an economic as well as political standpoint. If strikes are to be staged as and when they want , no government can carry on. Rajitha who usually takes correct political decisions too backed this view. He stood by Mangala. We have already pointed out , the unjustifiable series of strikes which cause hardships to the people can be stifled and strangled if at least one strike can be comprehensively and decisively defeated. Mangala the saner and sensible politico was toeing that line undeterred and undaunted. Mangala clearly said , call off the strike and come for discussion. Minister of transport Nimal Siripala De Silva too took that view . He said , until the strike is called off , there is no room for discussion. The deputy minister of transport Asoka went even beyond and insisted , the houses of the strikers should be traced and given retaliatory answers. While Sagala was saying the trade union terror should be defeated , Ajith Perera too holding a separate media briefing objected to salary increases being granted only to the railways. These views can be construed as the official stand of the UNP. Neither the JVP nor any Leftist group which shouts and screams even for nothing did not stand by the strikers while the ‘Bud’ Buddies remained silent. Besides when the public opinion mounted against the strikers and turned violent , none was ready to go forward and provide protection or avert it . That is, in the overall picture there was nobody to support the railways strike . In the circumstances the government was offered a golden opportunity on the platter . Even the GCE adv. Level students who suffered abysmally owing to the unjustifiable strike took the stand the strikers should be taught a lesson. The parents of the students too were not of the opinion that the strike must be ended by giving in. Therefore every circumstance was in favor of the government and what the government should have done then was exploited the opportunity to the full. In this climate if the government had expelled the strikers ( laws could have been evoked because the strike was staged without giving notice) the public would have been most delighted. In addition the government could have implemented the alternative proposal that was before it , and tried to restore the railway transport to normalcy while also streamlining the bus transport services. Simultaneously with the blessings of the people the strike and the strikers could have been brought under control. If the railways was made an essential service through a gazette notification , and the strikers were incarcerated , nobody from any quarter will oppose it for such action is not undemocratic at all. Sirisena the foe of good governance…. While the golden opportunity was knocking at the door , and all the odds were in government ‘s favor , what did president Sirisena do ? He gave a chance to the heratless striking villains to come for discussions with him following the intercession of a media acting as a ‘broker’. He granted this opportunity after grossly betraying his own government’s finance minister and transport minister to the detriment of the entire country. Sirisena who boasts of a long 50 years political experience by this action demonstrated again he is a Sillysena who hasn’t even the political acumen of an ordinary pradeshiya sabha member. Little wonder the country has been driven into chaos and confusion. If Sirisena alias Sillysena had even a trace of gray matter he would not have agreed to discuss with the callous strikers at this juncture since the desperate strikers who were eagerly waiting for such a face saving opportunity to get back to work without further self disgrace took advantage of the offer. If he is an intelligent sagacious president , he would have instead told the strikers to discuss with the minister in charge instead of himself going for negotiation. If he had done taken that course of action , it would have created a most salutary precedent while the repute of the government , finance minister and the transport minister could have also been safeguarded without taking over a burden which was not his . Instead of that, the president by holding discussions with ruthless callous villains who were acting based on a conspiracy , made a hash of the whole issue. Sirisena agreed to discuss in keeping with his overriding selfish self seeking traits only to achieve cheap popularity and score political plus points .Thereby, he not only grossly betrayed the cabinet , government and the masses who stood by him but also gravely jeopardized their precious interests while also securing minus points for them by playing into the hands of the cunning and callous strikers whom the whole country was disdaining and detesting. Therefore the time is ripe for the UNP at least now to think seriously whether it can still go on further with such a rudderless , policy-less , aimless and above all brainless Sirisena alias Sillysena a confirmed proven enemy of good governance.